When we talk about dental health, we don’t just mean your teeth and gums! During check-ups, we always make sure that we run a thorough inspection of your jaw, too. Many of our patients suffer from jaw pain and presume that this is tooth related – however there is much more to it than just toothache. If you don’t have good oral health, you will most likely end up suffering from gum disease. Bad dental health can progress into this troublesome condition and lead to issues relating to the bones and tissue that surround and support your teeth. Our number one tip to prevent any pain relating to teeth, gums or the jaw is to ensure you are practicing a good oral health routine! Brush morning and night and always make sure to floss! Mouthwash is great for flushing any remaining debris away, too. It is common for wisdom teeth to come through between the ages of 17-25. Unfortunately, the process of these larger adult teeth pushing through can cause quite a bit of trouble for your jaw. This is worsened if the wisdom teeth are ‘impacted’ – which means they are growing into or even under existing teeth, therefore unsettling the formation of teeth and jaw. Be sure to keep an eye on these, as sometimes infection can occur and cause painful swelling. Always notify your dentist of any new or persisting pain. “I don’t grind my teeth…” – we often hear this from many of our patients suffering from jaw pain! In reality, many people do not realise they have a problem with teeth grinding as it usually happens whilst they are asleep. 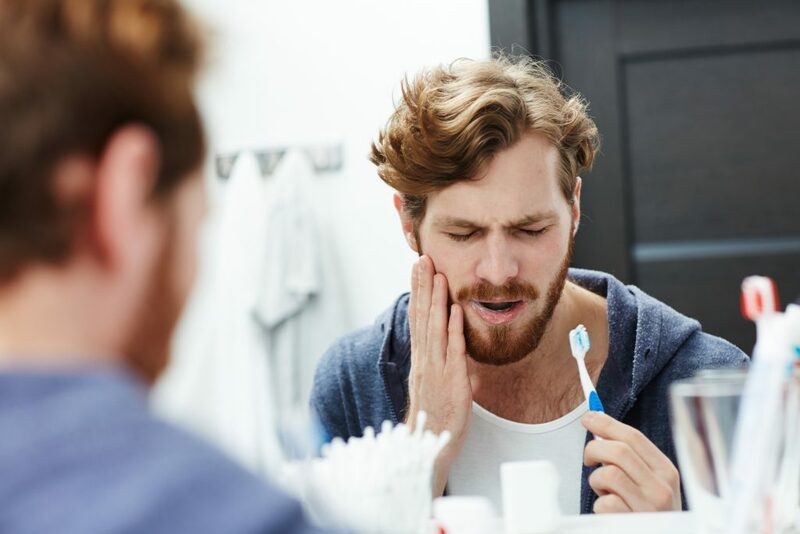 Lots of things can bring on teeth grinding, including anxiety, stress, some medical conditions and even certain types of medication – and it’s one of the most common causes of jaw pain that we dentists come across. We can help advise you on how to prevent it from continuing, sometimes with the help of a special mouthguard. Even if there is an untreated cavity in one tooth, in a lot of cases the pain does not stay localised in that area. When left unfilled, cavities can develop infections which spread along the jaw and teeth – causing patients a lot more hassle than getting into the dental surgery to have a filling would be in the first place! Make sure to be keeping on top of check-ups and treatments with your dentist to prevent issues like cavities getting worse. Experiencing jaw pain that won’t go away? Worried you have an oral health issue that could lead to jaw pain? Don’t worry! Gentle Dental Care can help. Get a check-up booked in by calling us on 0151 722 3000.